I suspect that this is a first - the first time I have reviewed a book twice! This was the first Roger Pilkington "Small Boat" book I came across and it covered the mid point in his European travels. As such it was rather like joining a conversation mid way through and not knowing what came before I struggled to get into the account. However, I persevered and have now read all but one of the preceding books and feel very much part of Piklington's 50 year old watery wanderlust. The Commodore is ageing having served them well for 14 years and is now on its 4th engine. The author steadfastly avoids bringing the crew into the tale and prefers to make it all about the boat and the places they visit. But that's not all - he also has a fascination with medieval history and recounts the events which took place in centuries past, fact mingling with legend and paying close attention to the religious struggles which befell the initiators of the reformation. I had considered skipping this book and jumping to the next edition set in the South of France, but as my last reading was over two years ago and out of sequence I decided to re read it. I have since learned much about Pilkington's non conformist beliefs and the events which surrounded a previously under appreciated period in Europe's history all traced out as the family ventured south from Holland to the southern end of the Rhone via Paris in two holiday trips. Whilst I remembered accounts of leaping weirs in flood and taciturn lock keepers, there was much which had passed me by and the book fully justified a second read. The tantalising element was their trip down a drought struck Rhone where one third of the distance was covered in a single chapter, but I shouldn't have worried. This rapid and eventful descent is covered in full in the next book which I read back to back. Belle picked this book up for me during a recent visit to Barter Books in Northumberland. Of the the waterways books she bought this seemed the least engaging, but I asked her to buy it as it could be compared to Gerard Morgan-Grenville's works which I enjoyed so much last year. The book is one of his 19 "small boat" series which covers most European waterways travelled over a thirty year period from 1956. The miracle is that I have never come across them before. Before I reflect on the book itself, its worth sparing a few thoughts about the author himself. 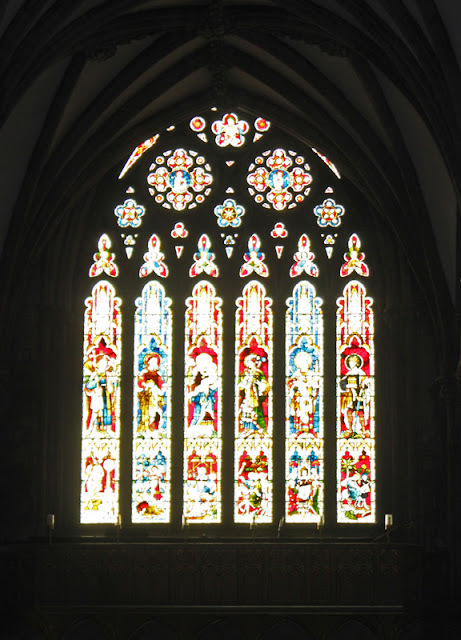 Roger Pilkington was born in 1915 into the Pilkington Glass family and his obituary (he died in 2003 at the age of 88) tells us that he was a "Geneticist by training, a Philosopher by instinct and a Christian by conviction". But most of all he is remembered as a prolific writer on travel, Christianity and morality, and children's books. Whilst his father and elder brother ran the family business, the company rules stipulated only two family members on the board so he was obliged to follow other interests. After his time at university he spent time working for and being president of the London Missionary Society, contributing to the theological and moral debates of the day but most of all he was captivated by water travel. Initially this was aboard Commodore, an ex Admirals Barge he bought from the Navy in 1946 and in which he travelled the waterways of Europe till her wooden hull degenerated in the mid 1960's. This was replaced by the purpose built steel hulled Thames Commodore which carried him on for the next two decades. The link to the Pilkington glass business explains his ability to spend extended times abroad - far more than most of us have at our disposal. OK, so that's the background to the author. What of the book? 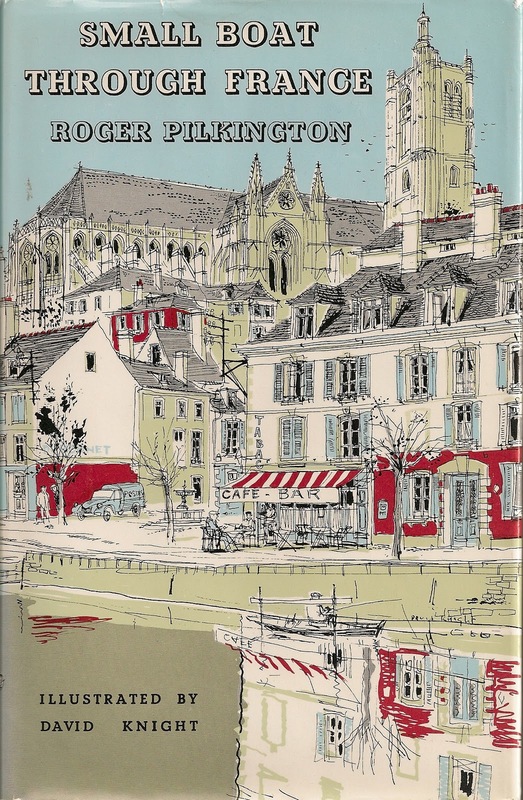 As I picked up the book by chance I didn't start at the beginning and the account of Pilkington's journey from Holland to the South of France in 1962 reads as an episode rather than a story in itself. By that I mean that it has no beginning and no end, and it is left to the reader to work out what went before and where the tale will lead. Of course, none of us really know where the tale of our lives will lead but working out the start helps put things in perspective. It is important to recognise that this was written in1962, age of the Bay of Pigs and the Cuban Missile Crisis. The watery world they discovered was very different to that recorded by Morgan Grenville just 10 years later. In 1962 water trade was in sharp decline but it still existed and the canals were active commercial entities. Whereas Morgan-Grenville recorded the people and characters he met along the way, Pilkington recorded the history through which he passed. In some ways this makes his books more timeless, their contents remaining relevant engaging in spite of being 40 years old. 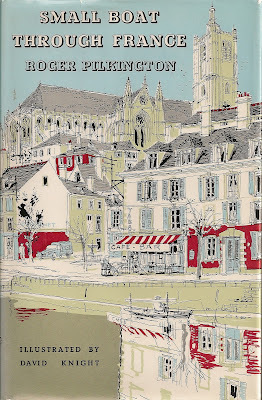 Small Boat trough France offers a slice of France from the Channel to the Mediterranean, with the focus of the author being over his shoulder into the history which surrounded him set against the scenery and watery travails through which he passed. Even though the book was written before I stepped out of my nappies I was lost in the journey, part of the crew and there on the Commodore as she journeyed between two oceans. The book left me wanting more, more of what went before and more of what was to come. So. if any of you guys have a Small Boat book and fancy doing a swap let me know. Otherwise I will be trawling Amazon for more. Following a question by a friend I discovered the whereabouts of Blews Wharf which set just above and to the north of Aston Junction and Aston Top Lock. 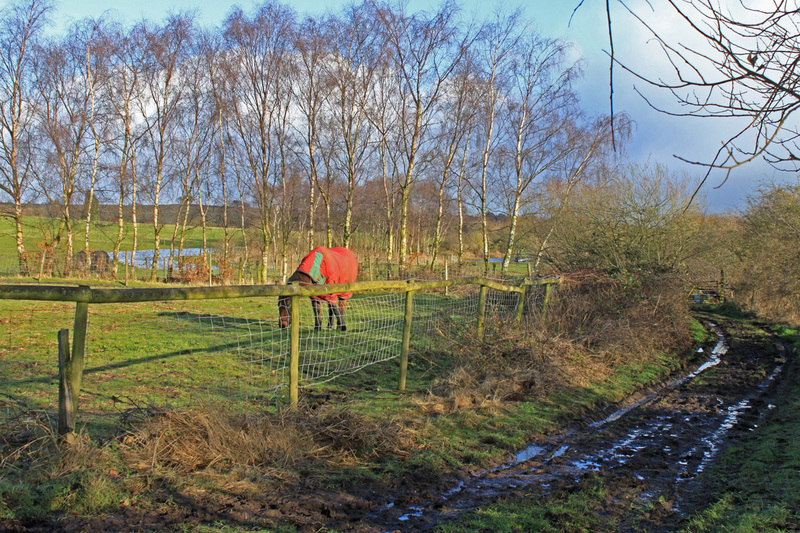 There isn't much to be see on the ground today, just a raised towpath but behind this lump there was an extensive basin and wharf. Today's road layouts are unchanged allowing you to place the basins with some accuracy. 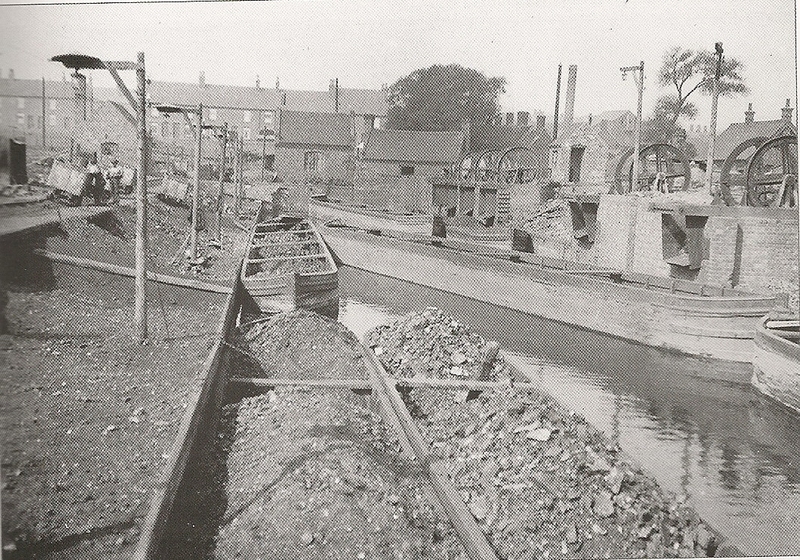 Today I am breaking one of my principles - I am writing a post about a lost canal before I have paid it a visit. Not a big issue I know, but I fee I need to offer some justification. The thing is that I regularly come across good images for lost arms of the BCN and then lose then before I get round to on the ground exploration. This is very frustrating and as my blog is increasingly morphing into an on line reference library I cant see why I shouldn't alter my approach. 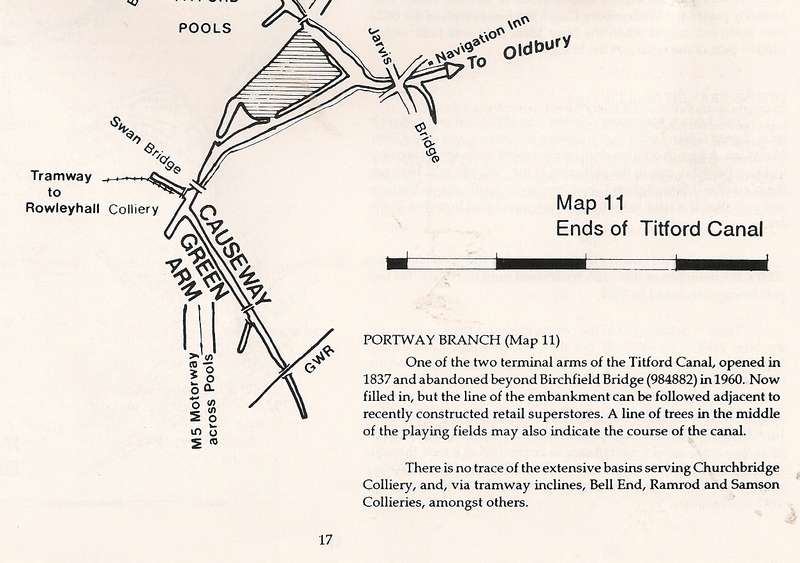 So here it is - The Causeway Green Arm which is at the southern end of the Titford Canal. Motor along to the junction where the Portway and Causeway Green arms diverge at the Titford Pools alongside the elevated M5. Today only a shallow stub remains, truncated by the M5, but Google Earth reveals the continuation of the arm beyond up to a railway line. 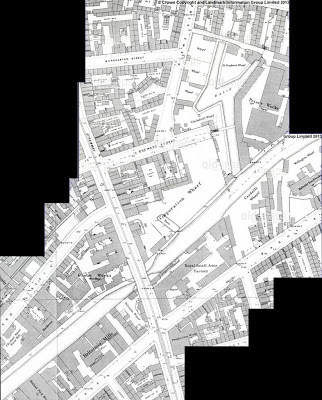 This extension was added in 1858 to serve collieries and brickworks including Rowleyhall Colliery. 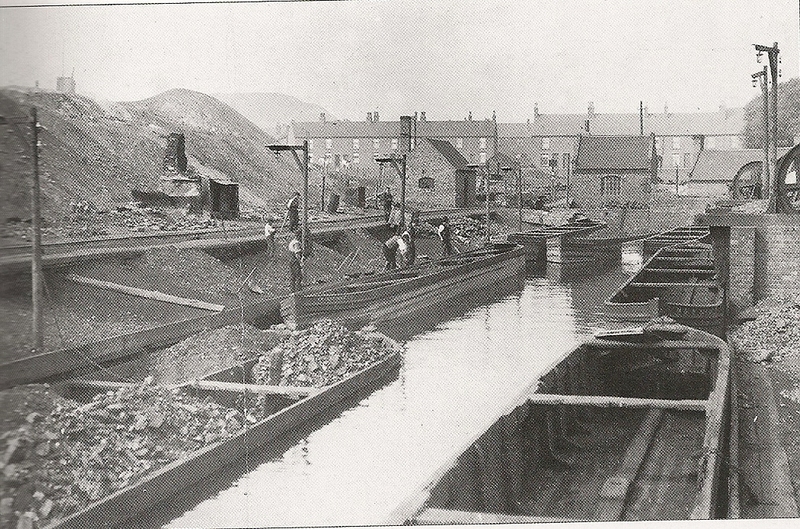 The images here were taken in 1898 at a basin near Titford Lane and York Road, with the originals found in the Alan T Smith Collection and a copy in Black Country Canals by Paul Collins. As those of you who read my blog regularly will know, I have a particular passion (obsession maybe?) with the BCN. But if you want me to be a bit more specific, it's the Black Country elements which really float my boat. And of the Black Country canals, the ones which I get most excited about are the "ghost" canals, meaning these which don't exist anymore. A strange interest I accept, but one which offers me lots of scope to continue by favourite adolescent pass time of just "poking about". I blame it on Paul Bell's dad you know. The Bell's lived next door (please, no Quasimodo jokes), Brian, Hazel and their son Paul. Brian used to dispair when Paul and I mooched around saying "were bored" and his stock answer was to go off somewhere and poke about - what was to say that if we took ourselves off to somewhere new and had a look around we would almost certainly find something which interested us. This somewhere new very often led to the banks of the River Bure and so my lifelong passion for all things watery. Fast forward 40 years and you still find me curiously poking around in my spare time. The backdrop couldn't be more different - for cornfields read chimneys, but the urge to get some boggy ground under my feet is as strong as ever. 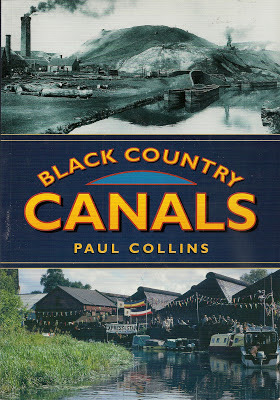 So all this is a long winded way of introducing Paul Collins Black Country Canals, published in 2001. Its a picture book drawing together a collection of black and white images from a variety of sources and over a 100 year period, supplemented by a light historical commentary. This is no "then and now" collection, but an idea of how "now" looks around the contemporary BCN does help appreciate some of the photos. I think I found this book in Pershore, along with a big pile of others which has represented the bulk of my waterways reading over the last few months. 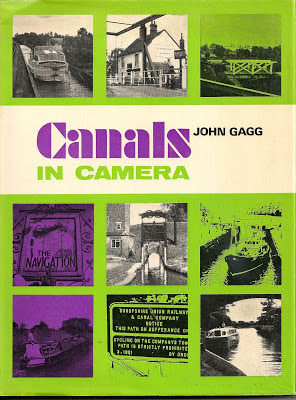 The thing which really attracted me, apart from the excellent quality of the period photos, was the liberal scattering of images from the lost canals - routes like the Causeway Green Branch, the Two Locks Line, Pensnett Canal, the Bentley and the Toll End Communication. Finding this rich seam of quality material has impressed on me the need to reference my period photos. All too often I find myself scratching around to find where photos come from so a belated resolution - reference all outside sourced photos. If you share my passion for old BCN photo's - this is a must have for your collection. There is a part of me that always wants to be back in the days of my childhood, a time when everything seemed stable and unchanging. I particularly hanker to return to the canals of my childhood - all those long weedy channels and overgrown towpaths. I received a double dose of nostalgia this week, starting with a meeting of the BCN society where the speaker didn't show up so we were treated to an impromptu slideshow of events in the late 1960's. 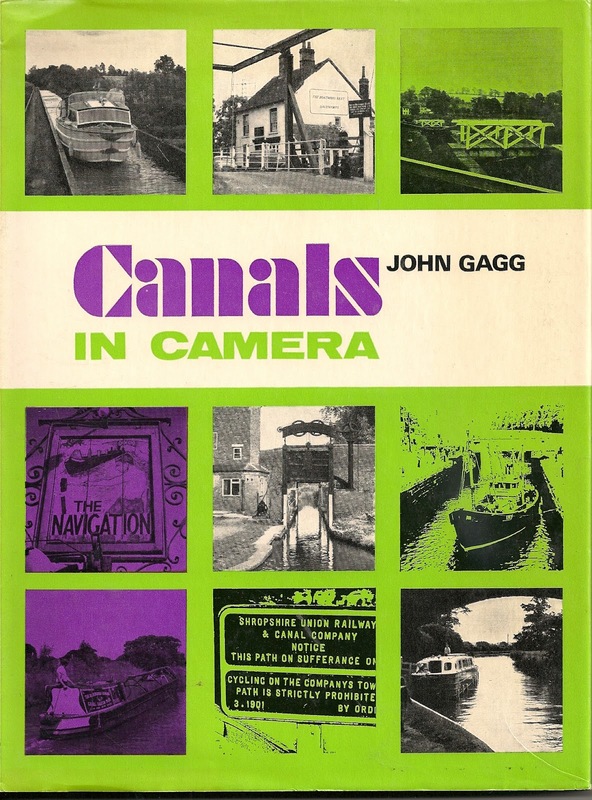 This blast of childhood memories was chased down with John Gagg's Canals in Camera. Dating this book was easy, with its price displayed as 50s and a "decimal price" of £2.50. This places it at 1969 / 70 and John's collection of black and white images are all from this period. Locks, Lock Gates, Paddle Gear, Balance Beams, Bridges, Boats, Junctions, Tunnels etc. The commentary isn't great but the narrative surrounding each plate if informative and it is fun identifying the subject matter. Many remain largely unchanged but some of the city-scapes are virtually unrecognisable. All in all its a fascinating "dip in" book, full of timeless black and white gems. This was another of Helen's finds from Barter Books "up north". Unusually, I remember her calling me at work with a list of possible purchases and her description of this one stood out. Do you remember the Royal Tournament shows on TV in the 1970's? Each year the event included a parade of Chelsea Pensioners who fought in the 1st World War, decked out in splendid red dress coats. And each year their numbers dwindled till suddenly we lost our last living survivor of the conflict - a position which will soon be mirrored with people who have stood on the moon. The same issue faces the Inland Waterways. In recent years we have mourned the loss of the last of the boatmen and the number of people able to offer a first hand account of life on the cut in its working era are going fast. 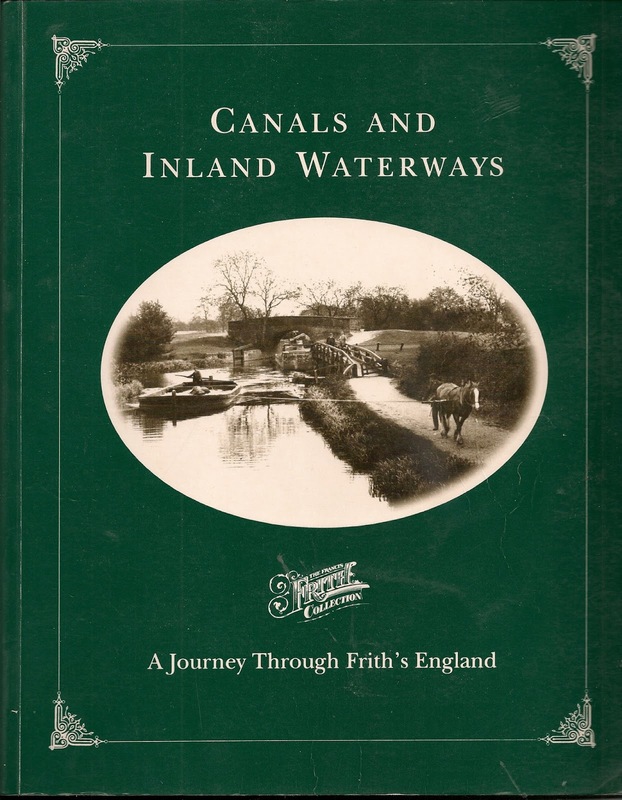 Euan Corrie recognised this some years ago and set out to paint a picture of the Inland Waterways at work through the accounts of a selection of interviews. 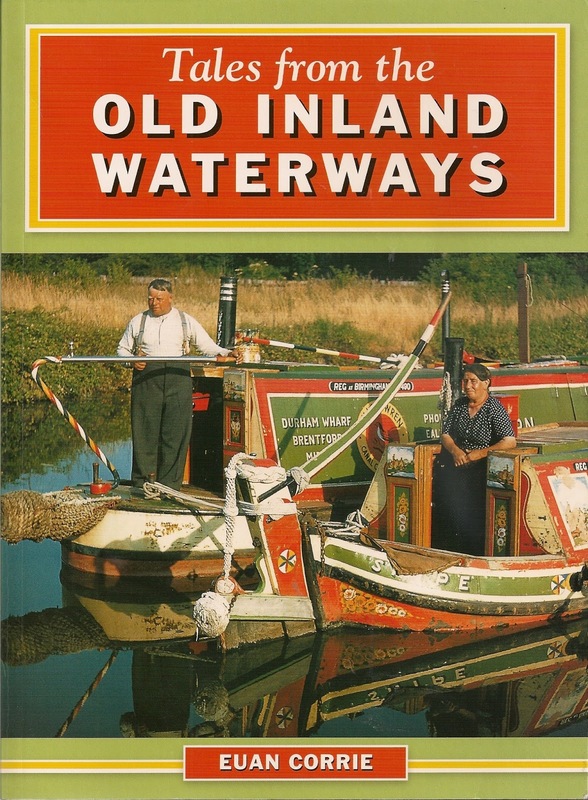 His book contains 12 accounts of various aspects of waterways life: Toll Clerk, Dredger, Lengthsman, Tug Operator, Carpenter and Boatman to name but a few. All these accounts have been framed and edited by the author to make them readable, whilst retaining at least a flavour of the interviewees own voices. All in all its quite skilfully done and allows 12 very different accounts to be melded into a single cohesive volume. Not surprisingly, I found the accounts which were Midlands based the most compelling, Harry and Sarah Bentley in the Potteries, Joe Safe from the BCN and finally (and undoubtedly my favourite) Bill Dean who recounts his time as Canal Inspector on the Shropshire union based at Norbury. Time may have stilled most of these tongues, but their voices can still be heard through their accounts of life around the cut in its final few decades of trading. 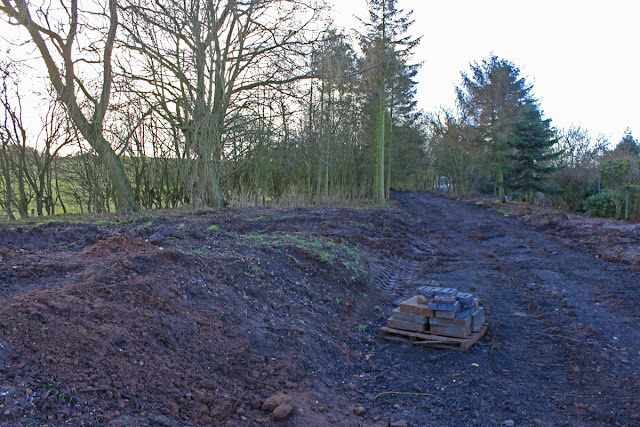 Specifically, I will never be able to pass through Lapley Cutting above Wheaton Aston without recalling the "Lapley Slip" which closed the canal in the 1940's and again in the 1960's - and search out the location where water saturated soil slid down the slope trees and all. If you only buy a handful of old waterways books each year, get this one. 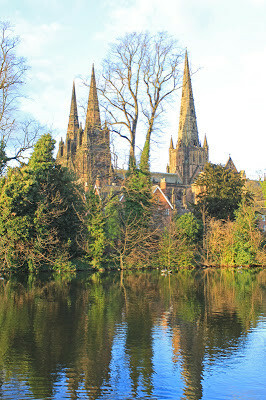 I have found myself at Lichfield Cathedral twice in 48 hours. 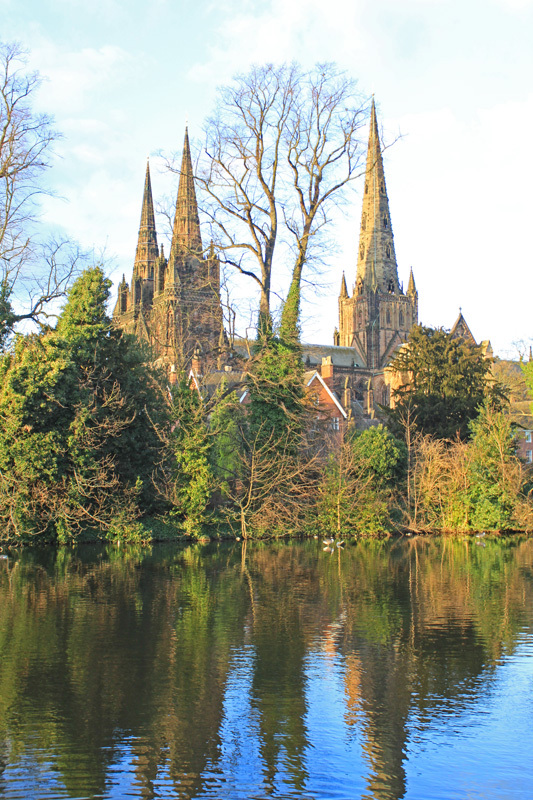 On Thursday evening we celebrated a friends birthday at Ego, an Italian restaurant overlooking Minster Pool with the impressive bulk of Lichfield Cathedal as a backdrop. Usually the cathedral is in darkness but on this occasion birthday boy's wife had shelled out £50 to have it floodlit for the evening adding a magical touch to the proceedings. Of course, I didn't take my camera so that goes down as an opportunity missed. 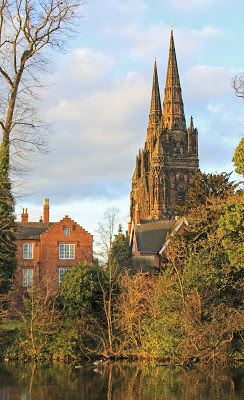 Saturday comes around and after spending a day out and about with my mother we found ourselves in Lichfield Cathedral having a good look round. 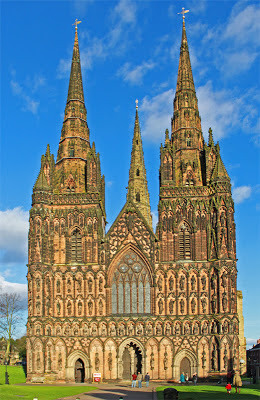 Lichfield is very familiar to me but none the less the cathedral remains impressive inside and out. Perhaps the loveliest thing about this cathedral is is homeliness. 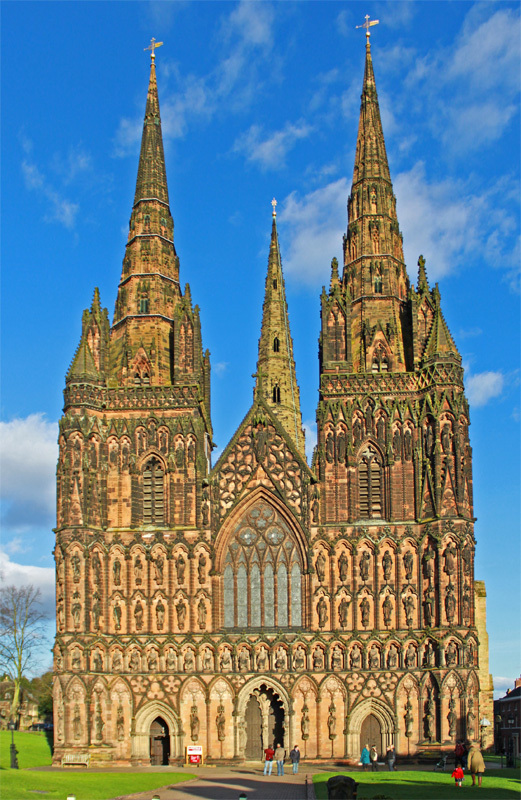 Some Cathedrals are cold and impersonal but Lichfield really does feel like a place of worship, with a personal welcome at the door and clear explanations about that Christianity is all about and where the cathedral fits onto the scheme of things. Of course, the ancient structure is an object of great beauty in itself, with its three spites soaring up towards heaven - a historic expression of mans worship of God. Its hard to resist getting a few shots on such a glorious clear winters day. 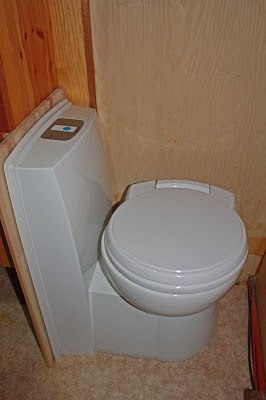 Time moves on and the new loo was finally delivered. I had a few scare moments when I doubted the wisdom of buying it off the internet. What I thought was a UK motorhome company turned out to the internet site for a Irish Camping shop, who has to import from Denmark who supplied to a main UK importer who then routed it via a local distributor whose schedule was messed up by the snow. Confused? Well, it took a month to arrive and my heart was in my mouth for a while. Much joy and celebration ensued in chez Ahab when this huge box was hauled up the ski slope which passed for our drive. So now to fit it in. I had measured carefully and built a back panel to fit it to, complete with a little shelf because I knew there was space. Big mistake - nothing ever fits 1st time on a boat does it? 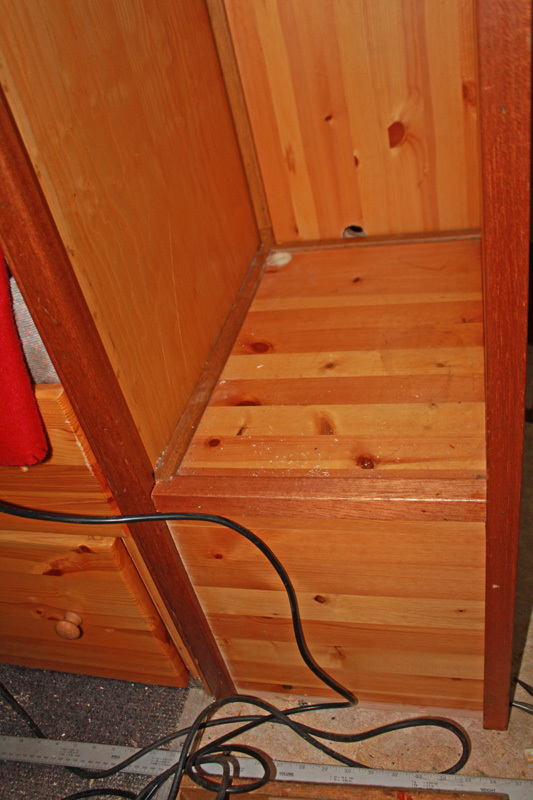 After much huffing and puffing the back panel was adapted to fit the vagaries of the boat, the bottom of the wardrobe removed to allow the cassette to be removed and a spare stored, the shelf in the wardrobe raised by 1cm to give clearance (how annoying to be less than 1cm too low) and the piping all threaded through. Now don't get me wrong, I like doing carpentry but on the boat there is never any space. I spend my time contorted into all manner of positions to get access to the various bits, sitting on tools and generally being frustrated. But the job is progressing. 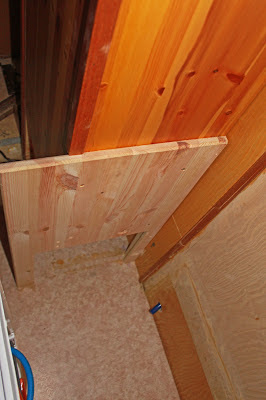 It will fit, the plumbing will work, the electricity supply is accessible and it now mainly a matter of tidying it all up and getting it varnished before the grand fixing in. Its not finished yet but we are getting there. Since my posts on the Ogley Locks I was told that I had missed one of the highlights, Lock 5 next to Barracks Lane. I dont usually miss major objects of interest, to I returned to the scene and the reason for my previous oversight became clear. It has virtually disappeared in the last few weeks.... Why didnt I visit in the Autumn? Lock 5 is indeed right beside Barracks lane, just behind Warren House Farm and immediately beside a new driveway which has been driven through the side of the lock. 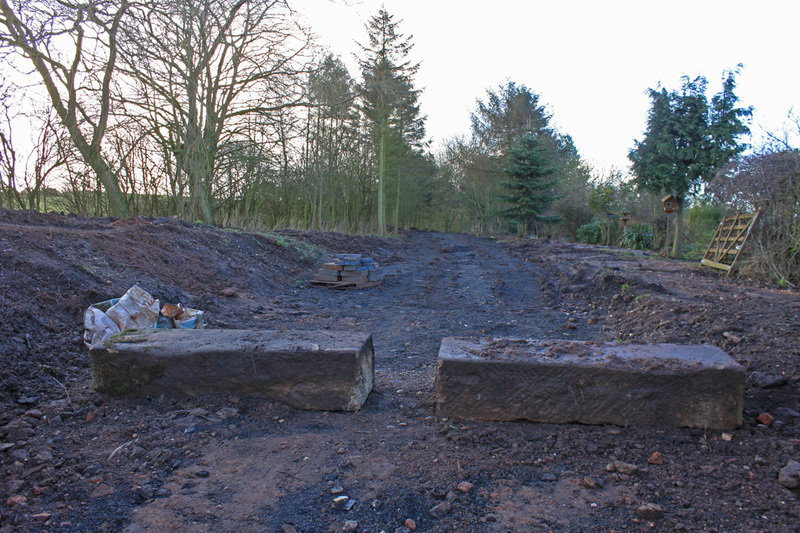 In fact, a couple of big coping stones are being used to block the roadway. 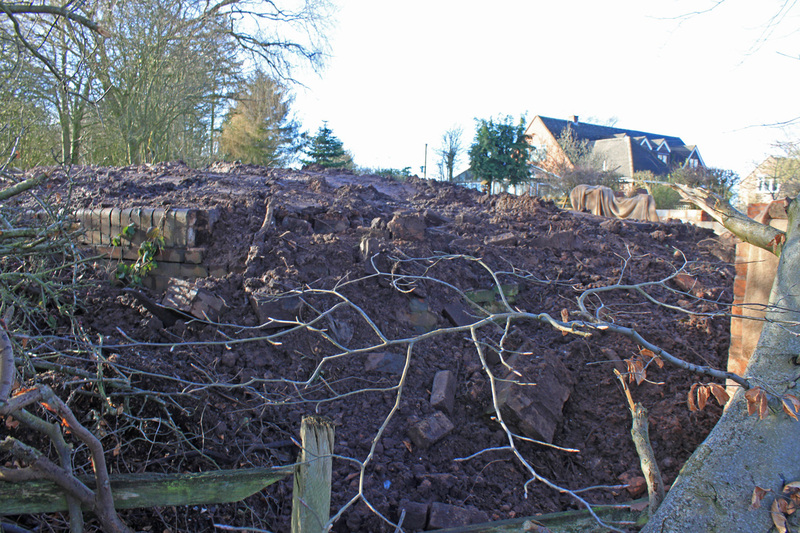 There is huge damage to this old structure, with just one lower wing wall standing, its old blue bricks emerging from amidst a sea of mud and rubble. The line of the canal upstream is now a driveway - surely a massive obstacle to the reinstatement project? So maybe not such a gem anymore, and more a tribute to contemporary vandalism. Surely the lock could have been retained as a feature? Anyway, I thought the restoration line was part of the local infrastructure plan and therefore known to the planners - or was this a renegade action by the land owner? Looking east over sites of locks 6 and 7. Turning east, the line of the canal is indistinct, but it would be mice to think it lan in the winding arc where the meltwater was sitting at the time of my 2nd visit. I cant remember how I came across this book, it must have been via a link in some on line research. Strangely, I never went out and found a copy but instead found an on line version which was free to read and, over the last few weeks have leafed through its 15 chapters - usually a chapter a day during whilst eating my lunch at work. 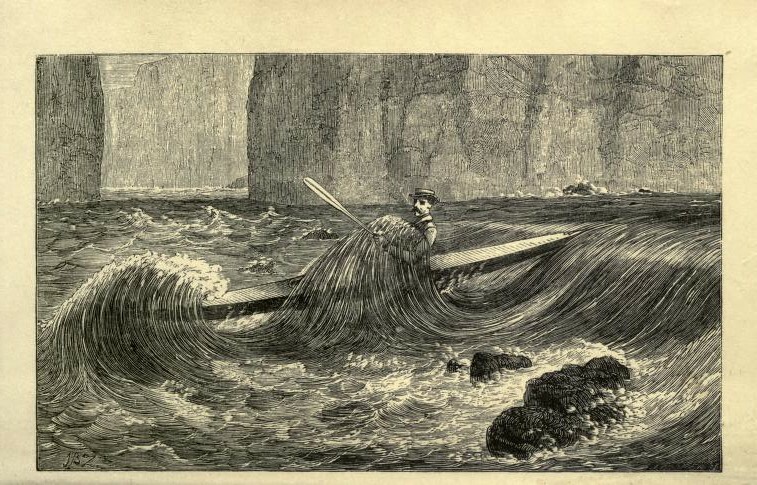 It was written by John MacGregor in 1866 and is an account of his four month, 1000 mile solo tour of waterways of France, Germany and Switzerland, making use of new fangled railways to bridge the watersheds. MacGregor designed and built his hybrid sailing canoe, naming it after a distant relative who was the famous outlaw. The book, or maybe more accurately a journal, is at time immensely readable and at others seriously tedious - so be ready for a bit of paragraph hopping here and there. It's written in a slightly surreal Victorian style unique to an Engishman abroad, taking an almost imperialist outlook on those he encounters but at the same time recording in minute detail where he left his canoe for the night and what he had for dinner! But amidst the somewhat pompous bigotry and banal detail there is an account of a really fascinating trip. Even now after 150 years, its easy to see why it was a best seller of its time. His readership was huge and varied, with word of his trip being so noteworthy that crowds gathered to cheer his passing. His work was so influential that even the great Robert Louis Stevenson built his own Rob Roy and set out in his wake. I am a great enthusiast for historical travelogues and for all its literary failings, this sits up there witht he best of them. Maybe not one to read from cover to cover but the long deceased Mr MacGregor will be sorely missed as my lunchtime companion. Short on plot but long on drama. Well, this never did set out to be a narrative based book. I have a passion for old waterways pictures and few collection can eclipse this one. The book, published in 1996, is a combination of about 175 black and white images all drawn from the Frith Collection. This is a huge collection lifted from the Frith empire, at one time one of the largest non fiction publishing houses in the country. This is important because the Frith Collection was of a uniformly high standard and these selected sepia images are ones to drool over during these long winter evenings. The books winds its way from south to north visiting a huge range of watery destinations, some on the connected waterways system and others from waterways which are or were fully navigable at some point in time. Its hard to describe the quality of this collection. Due their origins they have a family feel about them and the book draws you into a bygone age, a time when water transport ruled supreme. If you hanker for a glimpse of the old days this is the book for you. One to leave on the coffee table and one which will leave you coming back for another peek time and time again.